I love the gold, black and cream combination of colours of this small wallhanging, but of course if you buy the pattern from My Shop, you could make it in any colours you choose. It finishes 24” square – but the design could alternatively be used as the centre of a larger piece of work such as a medallion quilt. 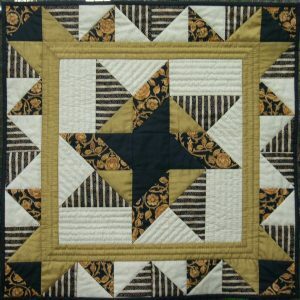 The 11 pages of detailed instructions take you through a lot of techniques which will be of interest to the more experienced quilter, who wants to improve the precision of their work and create something a little more advanced than Beginner level. As with all my patchwork patterns, the instructions have been written with a careful consideration of pressing directions, which may sound confusing at first, but automatically helps to line up pieces correctly in the final assembly. I like designing quick-piecing techniques, which are quicker to stitch, but also produce more accurate results. Usually this is because the bias seams are stitched before being cut, so the fabric is more stable, and less likely to distort. This little quilt was designed to further develop some quick-piecing techniques which I had started to explore in the Jack-in-a-Box quilt – this time, striped fabric was used, and different colours used at each end of the units to give a completely different design. 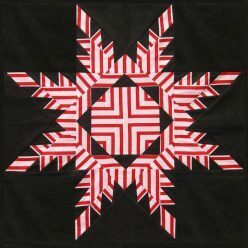 Other quilters sometimes use a quick-piecing technique known as “flip corners” to make the flying geese units, but this method is wasteful, as the corner triangles are discarded. I adapted it to use slightly larger squares, in a way which created extra half-square triangle units instead – and these are used to make a pieced border. A similar technique is used to accurately make the parallelogram units – also creating extra half-square triangle units for the pieced border. Look at the finished quilt – can you see how each colour pair in the border matches one end of these units from the centre? Making a pieced border is a great way of adding interest to a quilt, but getting it the correct size can be a real challenge, as tiny deviations from the planned 1/4″ seam can soon multiply, making your calculations inaccurate. My method is to use a plain spacer border (the gold one on Catherine Wheel) in between the centre and the pieced border – adjusting the size of this is much easier! Full details of this, and of how to mitre the corners are included in the instructions. 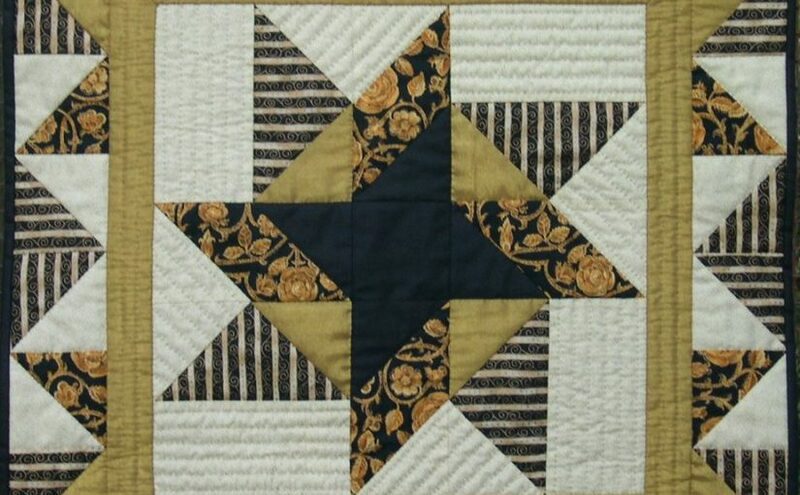 Catherine Wheel also has an interesting layout for the half-square triangles in the pieced border, which gives a lively effect augmented by the careful placing of the optional striped fabric.